In short, because we offer an Auckland wide plumbing and gasfitting service you can trust on; but first let us tell you a little about us, then we’ll tell you what sets us apart from the rest. L A Hughes Plumbing & Gas is a family owned and operated business run by Luke Hughes, a certified Plumber & Gasfitter with over a decade of experience. 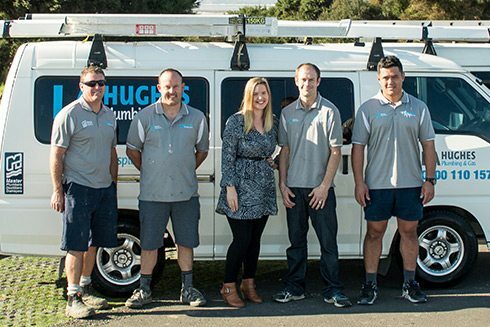 Our dedicated team provide plumbing and gas services to satisfied homeowners and businesses throughout the greater Auckland region. Offering reliable advice and complete solutions for all of your plumbing and gas fitting needs, we’re more than happy to answer queries or give advice and recommendations on the many decisions you face when building or renovating. With L A Hughes Plumbing & Gas you can expect friendly and efficient service. Our workmanship is to the highest standard – we back this with a 100% satisfaction guarantee. If for any reason you are unhappy with the job we’ve done, let us know and we’ll fix it for free. We’re members of the Master Plumbers, Gasfitters and Drainlayers Association and we’re fully insured for your peace of mind. What Makes Us the Plumber to Choose?